Feme: Whale hunting in Brazil and what we didn’t learn from it! Whale hunting in Brazil and what we didn’t learn from it! To this day, our knowledge on Brazilian whale hunting is still blurred, only few articles and books approach this subject and even those leave tremendous gaps about an activity that is supposed to have killed more than 4 thousand whales per year along the Brazilian coast in its prime years. Although it may sound bizarre for the younger ears, whale hunting only ended in Brazil in 1986. With such a recent past we may wonder if we have learned anything from an activity that almost drove many whale species to extinction that may help us avoid the same mistake with other species. Even though there is no definitive evidence, some researchers believe that the first indigenous living in Brazil also hunted coastal whales, prior to the arrival of the Portuguese. However, large-scale whaling only began after 1602, when Portugal issued the first whaling license for Brazil. 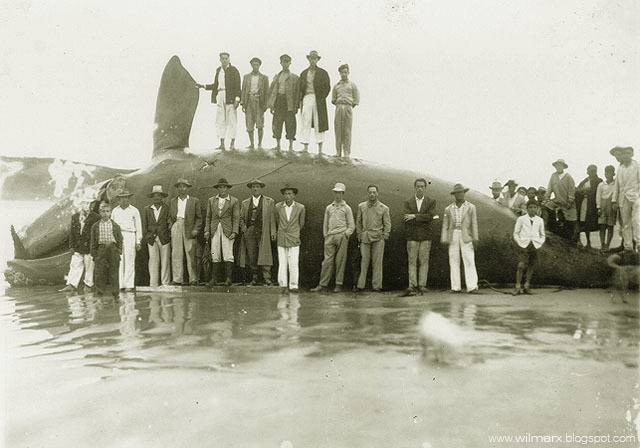 The first whaling installation was built in the island of Itaparica, Bahia state, followed by several others from the south to the north coast (states of Rio de Janeiro, São Paulo, Santa Catarina and Paraíba). In the next two centuries whales, mainly southern right whale, were exploited without any kind of control. In its first years, 3 to 4 thousand whales, mainly southern right female whales with offspring, are estimated to have been annually killed. The massacre of the adult reproductive females and their calves could not have a different result: in 1786 the annual catches of southern right whales fell to a thousand and kept declining until 1819, when only 59 individuals were hunted. As the catches of southern right whales declined, the target species changed in a desperate attempt to keep the activity profitable. Whales were hunted mainly for its fat, but practically nothing of the animal would go to waste. The fat was melted to make oil lamps to illuminate houses, streets and sugar cane mills. Part of the oil produced in Brazil was exported. The fins were also exported to Europe and used in various objects, such as umbrellas, brushes, and corsets. The meat was not really appreciated; it was first distributed among the slaves, the free workers and the poor, then later followed by an unsuccessful attempt to popularize its consumption. When that failed, the meat started being exported to Japan. Whaling was first done on small rowing and sailboats with manual harpoons. It was only in 1911 that a new Norwegian technology, using an explosive harpoon and large steam-powered whalers, arrived in Brazil, boosting the industry and accelerating further the already exhausted resource. To make matters worse, in 1912 the Brazilian government offered significant concessions aimed at revitalizing the whaling industry by attracting foreign capital and technology. At this point, other species were already being exploited as well, mainly the humpback whale and occasionally minke, and sperm whale. Imbituba-SC, anos 50 – Foto de João Hipólito do Nascimento (1920-1992). There was no regulation for whaling in Brazil, until in 1923 a general decree forbade the catching of calves and females with offspring. In 1967 Brazil finally joined international agreements banning the hunting of blue whales, but it took the country another 19 years of much fight and pressure from environmental groups and the media to finally ban whaling in 1986. By the time of the ban, most of the whales used for oil were commercially extinct, but by then the focus had already changed. In the 1950’s Brazil aligned its interests in modernizing its fishing with the Japanese’s interest in whaling for meat and also in fishing the Brazilian waters. For Japan, even the small whales that visited the coast of Brazil were worth the effort, and they did hunt the Brazilian coast legally until 1986. Therefore, the Brazilian whaling history compromised large and small species alike, including whales that were good for their oil or not. It is estimate that eight species have been seriously affected, and only a few so far have given signs of recovery. A história da Caça de Baleias no Brasil: De peixe real a iguaria japonesa. William Edmundson e Ian Hart. Disal Editora. 311 p. 2014. A history of Whaling in Brazil: from royal fish to Japanese delicaly. William Edmundson and Ian Hart. Ed. Pub. Pequena. 234 p. 2017. Cetaceans are not and never were ´resources'.